So you are thinking about keeping that cute little gosling in your home as a pet. Wonderful! Geese can make wonderful house pets. Keep in mind that at some point in time the general public was appalled and surprised that anyone would keep a dog or cat or parrot IN their homes. People now keep rats and skunks and racoons in their homes as pets. So a goose is not all that weird on the big scheme of things. *You do however need to know that the cute little goslings you are holding will grow to a very large bird. *Your housegoose is NOT a housedog nor a housecat in feathers. *Geese can and do make great guard animals. Many people that are not afraid of dogs are afraid of geese. *Housegeese need, that is NEED their diapers changed several times a day everyday, every single day. *A Housegoose will need to share your bathtub to clean up each day. 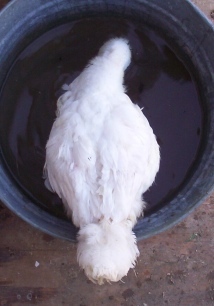 Your tub will have to be scrubbed down after the goose's bath and play time. Everyday. This page is just an overview of HouseGoose Care. Each subject dose have a full page at this site. This page is to give you an idea what housegoose care will be, the pages will go into details. Variety. Your housegoose needs a variety of natural foods. Your housegoose needs to graze in your own yard where you have not sprayed for weeds or bugs or to make your grass grow faster. Geese need greens. They eat bugs and worms and spiders, it is good for them. Let your housegoose outside on nice days in a fenced area for at lease a couple of hours a day without it's diaper on. Have a pool for it to drink from and play and splash about in. We have a flock of outdoor geese, Alice, our housegoose, grew up with most of them. She goes out and plays and hang around with them every nice day. She loves to go and be a natural goose. I throw any vegetables or fruit cuttings from our own meals and boy the ducks and geese and chickens as well as the goats, just love that. I throw out our banana peels, apple cores, orange peels, someone out there eat it and love it. If you have lettuce that is not really what you want to feed your family, give it to the outside geese. HOWEVER! If you only own one or two housegeese, only give a small amount. I go by the size of the animals head to gauge how much veggies or fruit to feed them. You can do the same. You would not give a goose, one goose a whole watermelon, but you might give them about the same amount, per head size, as you would cut for yourself. Also. Sometimes fruits and veggies are past use even for animals. You will also need a good grade feed that is made for a goose. If you only have one or two geese you will not need a 50 pound bag. If you purchase a 50 pound bag, be sure to store that feed in a large metal can with a tight fitting lid sold as a Trash Can. You will not feed your goose too much of this feed, but they will need some each and every day. Corn. Somewhere, someone, somehow, decided that corn is not good feed for animals. By it's self, as the full diet and only food souce, it is not. But the truth is, and especially in the winter months, corn is a very good feed for animals. Geese love corn. A little bit along with a variety fed diet, corn is good for them. Corn offers high calories. When I was a kid <many moons ago> my father always had me feed extra corn to my pony, horse, chickens and other grain eating animals "to help keep them warm in the winter." Your animals need those extra calories to offset any shivering they do in the winter months, just like people do. Ever hear the phrase "like a duck to water"? Well, geese are the same way about water as a duck. They want it, they need it, they love it. They need a water bowl deep enough to put their faces into when they drink. It is how they keep their nostrils clean. They love to splash and play as they drink too. 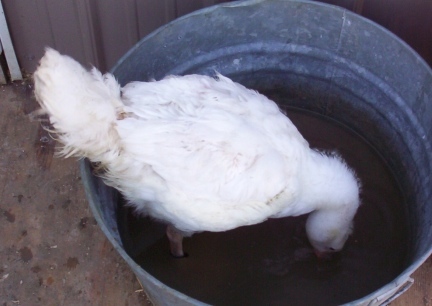 Your housegoose will need a bath at least four to six times a week. It is better if they have a daily bath, and to them, a bath means staying in the water for a longer time then you think they need to stay. Yes, they love to swim and dunk and splash and play and to be a goose/geese! Your goose will need to bathe in your bathroom tub in the winter, but in the summer they really enjoy a tub or pool to play and bathe in. We have several pools around in for our outdoor geese, but for our housegoose to bathe in and play in we use (in the warmer months) a small horse troft on the front porch. It keeps our housegoose's feet clean (after the bath, not full of mud) and she can splash and play as long as she likes. The photo is of Eden right outside our front door. Make no mistake, this small tub was not the only water Eden washed and played in, it was just the bathtub for when we needed it. Eden loved to go and play with the our outdoor geese each warm day and play in the pools, graze and "be a goose" with them. Geese love water. So keep those liquid filled glasses up high away from their reach. Yes, a housegoose will certainly, when given the chance, stick their heads right into a person's drink. If you are going to have a goose in your home, I am sure you are going to want it to wear a diaper. You will want to learn all you can about goose diapers and goose diaper holders. Geese, like human children, need to have their diapers changed several times every day. Dose their poop stink.....yes, it sure can and sometimes worse then others depending on what they have been eating....both human children and geese. But unlike human children, geese will always wear a diaper. Your goose will never be housebroken like a dog or even use the same area like a cat can learn. One thing I can not believe that people need to be told <grin> is to wash your hands with warm water and soap after each diaper change. There are diseases, including salmonella, that can be transmitted from pets to humans. Should you chose not have a housegoose because of this? Heavens No. Human babies can spread more to diseases to other humans then geese can spread to humans. Just remember to wash your hands with soap and warm water after each diaper change. These photos are of Eden showing how the Diaper Holder should fit. Where it should cover the goose's body to be sanitary. I designed it to hold a liner so that the Diaper Holder will last longer between washing. Goose Diaper Holder's should be hung to dry to hold their shape and size. They will also last longer if hung to dry. We do have an entire page "About Goose Diapers" and diapering a goose. Please see the menu. Many people are surprised when they hear that a goose can be trained. Some geese are even trained to do tricks and tasks and agility. We have pages here at the site about training your goose. On this page I just wanted to mention it so that people interested in keeping a housegoose or a goose in their house, that it is possible to train them. You will need to teach your housegoose to come when you call it's name. Your goose will also need to be a mannered member of your family. No one likes a spoiled child, all the worse a spoiled pet house goose. Your goose will need to know where it is allowed in the home and where it is not. It needs to know where and what it can eat in your home....and to not grab food from family members and visitors. A goose can become a "Bully", and it is not cute to the one being bullied. Do not allow your goose to start this behavior. Your goose also needs to learn to be still for a diaper change. You must start from the very beginning, from the first diaper being put on, to teach the goose that you expect it to be still in your arms while this is being done, until you set it back down on the floor, or if diapered while standing on the floor, to wait til you release it. You will need a "cue word or words", such as "all done" or "all clean", or even as simple as "go". Your housegoose will need a place of it's own to sleep each night. A dog crate will work great and you can shut the door so that the goose stays put until you decide it can come out. Geese should not wear a diaper 24 hours a day. A goose will need time out of the diaper if she is laying eggs....yes, they do, and no they do not need a gander around to begin laying eggs. Most bird lay eggs late in the afternoon or early in the morning. Yes, some people do leave the diaper on the goose and the eggs are laid in them. It can sure mean a mess to clean up. And if left too long the egg might get broken and really make a mess. But laying an egg in the diaper holder will probably happen from time to time for all of us that own a house goose rather then a house gander. Geese do not sleep as much as a dog or a cat. They will need toys around the house to play with to entertain them. Goose toys do not need to be expensive. Geese like rubbery toys. Even a string of rubber bands hanging from the back of a chair can entertain a goose for hours. Think about it, geese love worms, rubber bands move and look like worms. Geese, like people and other pets, like a variety of toys. I did set up a page on this site just for Goose Toys that even includes how to make simple and inexpensive toys that geese love to play with. You can buy parrot and dog toys at the Pet Store and or handcraft your own Goose Toys. Most goose owners are creative when it comes to goose toys. What looks like trash to a human, can be hours of safe entertainment for a goose. 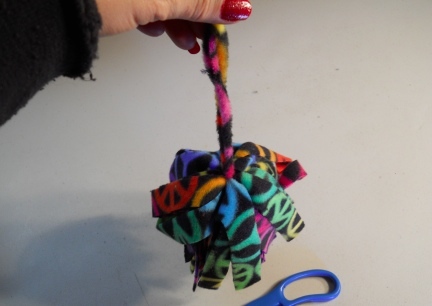 If you visit our Goose Craft page here at this site I have information for making this polar fleece toy for a goose. It is inexpensive to purchase the polar fleece, it can even by made out of a discarded jacket, and the toy is very quick and easy to make by any goose owner. A child could help craft this toy too. Yes! They are eatable. Yes, you may cook them the same way you would a chicken egg. Yes, they are large. Wouldn't it be great if geese, or some geese, or any goose, really laid a golden egg? You might find your goose's eggs are worth more then the average chicken egg. People in your area might be interested in buying your goose eggs fresh from the goose. There is certainly a market for "blown" goose eggs and or the crafts you could make with the eggs. 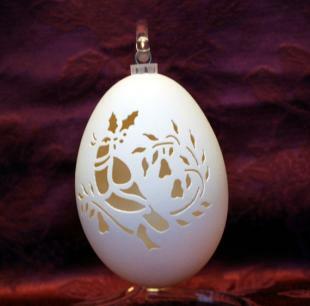 Blown Goose Eggs made into ornaments with carving or painting are very sought after. So try not to see those wonderful eggs as a burden or aggravating, but rather something that has value to you and others. So, maybe your goose DOES lay "golden eggs". 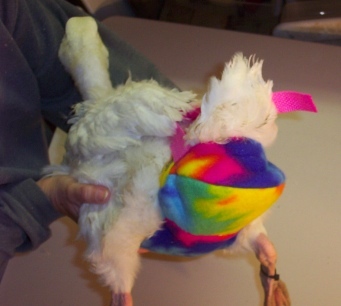 Your goose should not wear a Diaper Holder 24/7. But if your goose lays an egg in her Diaper Holder, the Diaper Holder should hold the egg until you notice it and take it out. Wash the egg and use it for eating and or crafting, why waste it. 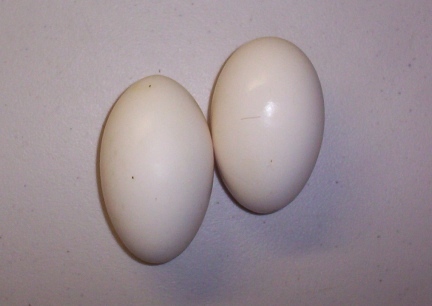 EGGS WILL NOT HATCH UNLESS YOU HAVE A MALE GOOSE/GANDER THAT HAS FERTILIZED YOUR GOOSE. Most Ganders can not mate with a goose wearing a Diaper Holder, but they will try. Those little goslings are so cute and soft and loving and they love to be held, will follow you to the ends of the earth, will eat right from your hand and it tickles.....but spoil that baby and you will have an obnoxious large flapping, biting, demanding bird on your hands. Spending time with, bonding and caring for your gosling is all very important. You need to hold them and love them and teach them. But catch that last word, teach or train them. Just like with a child or puppy, don't let a baby gosling get away with bad behavior just because it is cute while they are little. You are not doing yourself or the bird justice if you teach them this way. If you would not allow your full grown large goose to do something in your home, do not let the gosling do it young. Teach your gosling good behavior and you will have a bird that not only you will love to be around, but others will admire. I have seen people for many years that will buy a young animal, spoil it, not train it, then when the animal hits it's not so little and as cute stage, they get rid of it because it just will not behave. Sad. And worse. No one else wants it either. 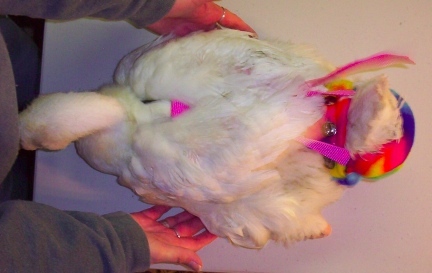 When it comes to a spoiled housegoose, this is a tragic thing. Not only will the spoiled ill trained goose not find an indoor home that it is used to, it will not know how to act around other geese and will not fit in on a "farm". You can not just turn a goose loose in a park with a pond, so what happens to this poor spoiled bird????? Don't let this happen to your beloved pet. Start training it as soon as it comes into your home. Teach it to behave, teach it manners, teach it to be loving with other animals and with people. Not only will you yourself like the animals better as an adult, if, God Forbid, your life would change or end, your goose would be able to get a good home with people that will love it. When you have a small pet, or a shot pet, walking around your home, you need to be very careful of where you are walking. Goslings, and pet geese, want to be with you, they follow by instinct. Goslings and of course geese, can seem to be underfoot, and then turn and run on a dime if startled. Watch where you walk, be aware of where your goose is around your feet, and tell others that visit your home to also be very aware of where your goose is when they are moving about your home. PLEASE TAKE A MOMENT AND READ OUR "GOOSEPROOFING YOUR HOME" PAGE FOR MORE INFORMATION ON GOOSE CARE AROUND THE HOUSE. PLEASE DO NOT BUY A GOOSE ON A WHIM. GEESE MAKE WONDERFUL PETS BUT PLEASE DO YOUR RESEARCH AND KNOW WHAT TO EXPECT AND HOW TO CARE FOR THEM PROPERLY. HOUSEGEESE ARE A LOT OF COMMITMENT AND WORK. MAKE SURE THIS IS WHAT YOU ARE LOOKING FOR IN A PET. A GOOSE IN YOUR HOME IS LIKE A PERMANENT HUMAN TODDLER INCLUDING THE DIAPERS. ARE YOU PREPARED FOR THAT? MAKE SURE YOU ARE BEFORE YOU PURCHASE YOUR GOSLING. IT IS NOT FAIR TO THE GOOSE FOR YOU TO SPOIL IT FOR A MONTH OR TWO THEN TIRE OF IT. WHAT WILL BECOME OF THIS LOYAL PET AT THAT TIME?? WHERE WILL IT LIVE THEN? The contents of this page for House Goose Care is still under construction. Please check back later!